Cloud Computing with Citrix technology is similar to using dumb terminals and a mainframe computer system. Except, you can run any windows application right out of the box! Users only need an inexpensive, low-power PC, Apple, Linux, or Android Mobile client device! These act as the "terminal" and connect to our Servers that provide high speed processing, larges volumes of centralized storage, security and backups. All programs and data run quickly and securely on our 'mainframe' servers sending only screen images down to the users "terminal" device. This centralization allows users to access applications and data on the 'mainframe' servers from anywhere they can access the internet or a telephone line. Our solution adds to that technology, a full-time staff of IT professionals to manage all the users computing needs. Perfect for a company focusing on its customers and business, and not trivial things like software updates and backups. 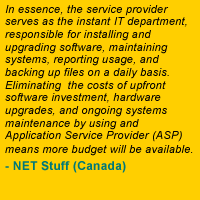 NO information technology staff costs! NO more computers or servers to buy! NO more Operating System upgrades! Economical: Prices start at less than $40.00 a month! Cloud Computing via Citrix Application Hosting is a state-of-the-art technology delivering high-end computing performance and access solutions at easily affordable prices. Small and medium sized companies can now take advantage of the same computing power previously only affordable to the Fortune 500. Users access a Windows desktop, applications, data and network resources that appear to be executing locally, but are in fact executing remotely. - All available 24/7 from anywhere in the world! “All software will be delivered as a service instead of a packaged product 10 years from now,” says Tim Chou, president of Oracle. Users of Cloud Computing via Citrix application hosting services, including a growing number of Fortune 500 companies, are motivated by the desire to focus on their business instead of managing software, according to a survey by Zona Research, which also cited cost savings and speed of implementation as important factors. Because Cloud Computing gives you the same benefits a Fortune 500 company gets from a multi-million dollar Data Center and dedicated IT staff! Plus: Global accessibility, and Government grade Security. – All for a small monthly fee. © 2000-2017 Digital Networking Systems. All Rights Reserved.